Incredible views and amazing sunsets await you at La Costa Lotta – a stunning vacation rental that is located on a private cul de sac with 400’ ft. of water frontage and 2 boat slips. If you love to spend time on the water, this is the perfect spot for you. Bring your boat, jet ski, kayak, fishing poles and leave the rest behind; When you stay at La Costa Lotta, you will have no need to spend a lotta, because everything you need for the perfect family vacation is at your fingertips. Guests will want to spend ample time outside, thanks to La Costa Lotta’s extensive outdoor grounds which include a sprawling private pool with water views, a pristine waterfront that’s perfect for launching vessels of all varieties, a fire pit, a fenced backyard, and access to a community sound beach and tennis courts. Step inside and let the games continue in the recreation room with pool table, or relax in one of two queen bedrooms with a queen bed and cable TV. The world is your oyster at this beautiful waterfront retreat. There’s plenty of room to stretch out relax in the upper levels of La Costa Lotta, where the three bedrooms, living space, kitchen, and dining area have been outfitted with pristine coastal decor and appointments. Relax in the private bedrooms, or enjoy those stunning local sunsets from the vantage point of multiple common rooms. The water sets the scene for a dreamy vacation in this corner of La Costa Lotta. 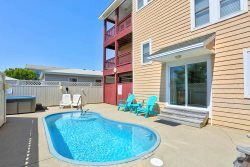 Enjoy beautiful sunsets from the vantage point of your hot tub or private pool, or just unwind on the sprawling decks and toast another perfect day at the beach. At La Costa Lotta, every vacation day brings a new reason to celebrate how great life on the Outer Banks can be.